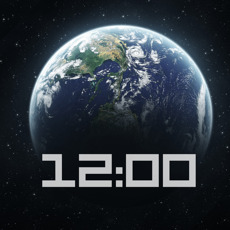 Download Earth Clock Plus and enjoy this beautiful clock on your new iPhone or iPad. Animated rotating earth and star background for your devices. -Simple swipe on screen to switch clock style or camera direction. -Swipe left or right for change clock style. -Swipe up or down to change camera view direction.